And with these special times comes a lot of food. 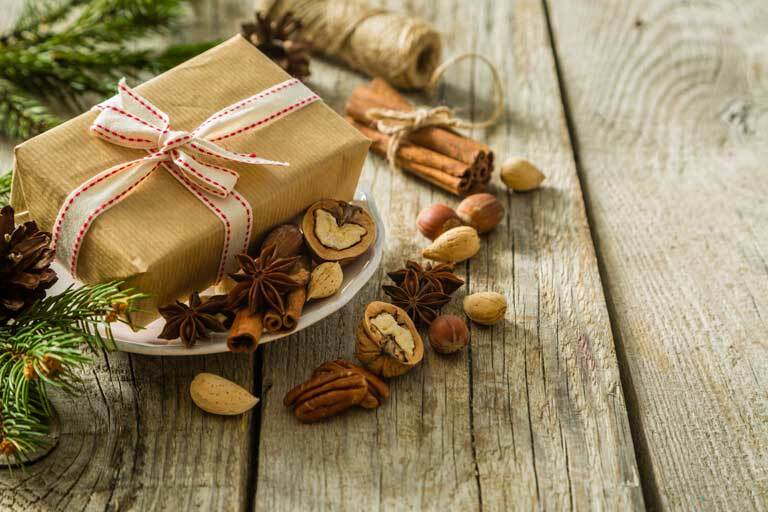 While some holiday favorites are rather unhealthy, we’d like to shine a light on one of the popular holiday snacks that can actually be really good for you: nuts. Raw nuts are a natural food and are rich in nutrients, leading to many benefits. Multiple studies have shown eating nuts to be associated with a lower risk of heart disease. The American Heart Association recommends including unsalted nuts as part of a heart-healthy diet, alongside whole grains and fruits and vegetables. Its official recommendation is to eat four servings a week. A serving is about a small handful of nuts or two tablespoons of nut butter (such as peanut butter or almond butter). Nuts have been proven to help lower low-density lipoprotein cholesterol. This is what is commonly called LDL or bad cholesterol. Oddly, it’s the high fat content of nuts that counteracts the LDL cholesterol and helps keep arteries healthy. Don’t let the fat content of nuts deter you from eating them in moderation, however. Nuts provide unsaturated fat, a great substitute for the saturated fats found in meats or dairy. They are also high in fiber, which helps you to feel full. According to “Health Benefits of Nut Consumption,” an article by Emilio Ros presented by the National Center for Biotechnology Information, studies have shown no weight gain in subjects who ate a moderate amount of nuts, and some subjects actually decreased their body mass index. But nuts are good for more than just the heart and circulatory system. They are a good source of protein, which is useful for muscle growth and maintenance, and calcium, which is good for your bones. Different varieties of nuts are also high in other nutrients. Vitamin B3 abounds in pecans, while pistachios are high in lutein. Hazelnuts contain a lot of folate, and cashews offer magnesium. So try a variety of nuts instead of just one or two types. Studies also indicate that eating nuts may lower the risk of gallstones, diabetes and cancer, though more research needs to be done in those areas. Of course, many people are allergic to nuts, so always take allergies into account when considering adding nuts to your holiday offerings. If you are serving them, keep them separate from other food items or include a sign with a dish that contains nuts. It’s also important to remember that sometimes nuts are not served in the healthiest way. Adding sugar, chocolate, salt or other typically unhealthy ingredients can counteract the health benefits of eating raw nuts. As you can see, there are plenty of good reasons to make nuts a snack of choice in your diet. But perhaps one of the most compelling comes from a 2013 study in the New England Journal of Medicine. The study pulled from two other studies, compiling information following more than 100,000 people for 30 years. Researchers found that people who ate nuts daily were less likely to die, specifically of heart disease, respiratory disease and cancer. Now that’s something to go nuts over! So choose some almonds, walnuts, pecans, peanuts or other nuts at the next party. Maybe you will even start a healthy habit you can carry on during every season.